Pastor: Rev. Dismas Veeneman, O.F.M. Conv. In Residence: Rev. Adam Bunnell, O.F.M. Conv. Sundays — Sat evening: 4 p.m.; Sun: 8:00 a.m., 9:30 a.m., 11:30 a.m.
Holy Days — Holy Day: 8:15 a.m., 7 p.m.
Daily — Mon–Sat: 8:15 a.m. 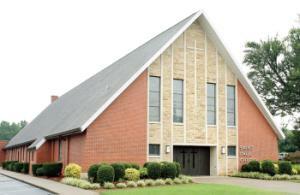 The history of St. Paul has its roots in the establishment of St. Andrew Parish in 1851. St. Andrew was located in what is now St. Andrew Cemetery on St. Anthony Church Road. In what had once been considered Jefferson County’s unhealthiest region because of swamps, peat bogs, offensive vapors, plagues, malaria, and other diseases, St. Andrew—called “the church on the hill”—served the sturdy pioneer settlers for fifty-seven years until it closed in 1907. The first church at St. Paul’s present location was built in 1909, and at that time the parish was placed under the care of the Conventual Franciscan Friars. In 1958, the present church was constructed. The stones used in the sanctuary of today’s worship space and the large statues of Saint Paul and Saint Francis are from the original St. Andrew Church. The parish cemetery where St. Andrew stood is owned and maintained by St. Paul and is still used by parishioners and others who wish to be buried there. An outdoor shrine to Mary also stands on the spot of the original St. Andrew Parish. The Sisters of Mercy came to St. Paul in 1910 to teach nineteen students in the school. The present school building was constructed in 1941 and was enlarged in 1953, when enrollment had grown to 1,100 students. St. Paul School remains a vital part of the parish. St. Paul became the mother church (wholly or in part) of at least eight other parishes. Changes to parish boundaries shrank the area served. Local residents were predominately Catholic or Baptist during the 1950s, but as the population grew, other denominations also built churches. Conventual Franciscan Friars have been St. Paul’s pastors since 1909. These sincere and effective homilists have formed deep bonds with parishioners, both as a group and as individuals. St. Paul Parish, with around 1,900 parishioners, has a rich history in the Pleasure Ridge Park neighborhood and has made many contributions to the spiritual and educational needs of the community.